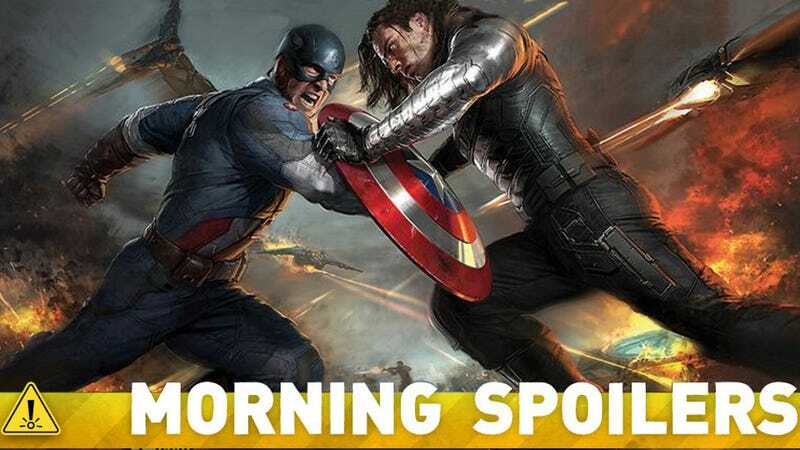 Something universe-changing will happen in Captain America: The Winter Soldier. A new villain could be joining The Amazing Spider-Man. A major character won’t be in Avengers: The Age of Ultron. The X-Force script is being written right now. Plus, watch a preview for J.J. Abrams' new series Believe. Spoilers below! Joe Russo: The interesting thing about that is that the script was structured so well that it’s not really something that… The things that happen in the movie are really germane to the movie, and germane to Cap. The big shift in the universe happens because of him. It’s not something where we had to feel like we had to patchwork in all of these other narrative elements, it’s really Markus and McFeely wrote an amazing script that really streamlined this concept that Kevin wanted to get out there. Anthony Russo: And it’s very personal to Cap, too. I think that’s the other thing, even though it’s a big event that connects it to the rest of the universe, it’s very much Cap’s relationship to that, and we enter the whole thing through him. So it’s all riding on his shoulders and in terms of his experience at this moment with this movie. AR: The movie was shot largely in a very verite style, which is unique for Marvel’s movies. They really embraced the approach to it, and it’s a very experimental approach. It’s a very grounding approach. There’s a strong edge to the film. It’s very visceral. It’s got a lot of action in it, but I think it’s definitely a movement, tonally, in a different direction. It’s just great to be able to add another color to the [palette] of these movies. According to Joss Whedon, Agent Coulson probably won’t be in the movie. Well, it seemed to me that one of the beautiful staples—actually of the X-Men films as well as the comics—was Logan's interaction with history, and that when you have a character who's been immortal, there's a quality that's not unlike Zelig, frankly. He's been everywhere. But I really loved that idea. I really felt that the idea of "Why Japan? What is bringing him to Japan?" And in Claremont-Miller it's because he has an ongoing relationship with Mariko before the comic book even starts. That seemed weird to me, to land on a guy living in the Yukon who's having as a pen pal with a married woman who he's had an ongoing relationship with. I couldn't quite piece together how exactly I'd do that from the opening frame. Actually, Chris (McQuarrie) had already moved away from that, but it still meant that I wanted to understand where he was coming from at the start. What opening in Nagasaki did is it did several things for me—one is it created a connection with someone in Japan that would be then reunited by his return. It also obviously set up the journey in the end of the film—we can't really say it in many ways. I also thought that when Darren [Aronofsky] separated from the film and the tragedy occurred in Japan, the tsunami and the resulting disasters after it, it felt to me that you couldn't respectfully make a film in even the decade of what had happened in Japan without in some way acknowledging what the Japanese people have muscled and suffered and held together through. I didn't think it was appropriate to actually reference the actual, recent incident in Japan, but I felt that it's so amazing when you think about this not enormous country has buffeted most of the nuclear incidents — two bombs and this horrible reactor accident — that so much of the nuclear action globally has occurred on this one island and the culture's ability to somehow regroup, rebuild and go on. So visiting Nagasaki was out of tremendous respect, also a way I felt to both raise and acknowledge what that country has persevered through. A motion poster for the film adaptation of Richelle Mead’s Vampire Academy novel has been released. Because they were about to die! He was a little boy in that scene. It's not like they were hugging or holding each other. His head was in her lap; he's a little boy. That's an Easter egg... When he was a little boy, Junior said, "I only wanted to help you because you were sick." That's going to be very important. There's going to be so much that's going to happen between Angie, Big Jim and Junior. I can tell you she's not going back into the fallout shelter. She's going back to work at the diner. “Imperfect Circles” – Big Jim takes matters into his own hands when he feels his authority slipping away, and the dome displays its power when a life is taken just as a newborn arrives, on UNDER THE DOME, Monday, August 5 (10:00-11:00 PM, ET/PT) on the CBS Television Network.